Blackbirds (Miriam Black #1) (Paperback) | Let's Play Books! Couldn't put this book down! A young woman cursed with a powerful paranormal ability takes drastic action to escape her fate. The prolific and often profane Wendig (Zeroes, 2015, etc.) originally published this novel in the U.K. in 2012, and he seemed to catch readers by surprise with the foulmouthed, punk-rock girl at its heart. The first in a series, this delightfully vicious and bloody urban horror novel provides a perversely entertaining introduction to a dangerous fugitive with a little something special up her sleeves. Miriam Black is a chain-smoking, hard-drinking, deeply paranoid runaway who's been living with a unique curse for eight years: whenever she lays a hand on someone, she sees exactly, precisely when and how they're going to die. Sure, it freaks her out, but she doesn’t let it stop her from dropping in on perverts and low-lifes at the moments of their demises to lift their wallets. “The rule is, it’s one and done,” she tells one amateur sleuth. “I get the vision once. It doesn’t keep happening over and over again—though, I’ll tell you, some of the really bad ones will keep a girl up at night.” Miriam is disturbed when she touches Louis, a seemingly normal truck driver, only to discover that the last thing he says at the moment of his death is Miriam’s name. Soon, there are killers after her, and in order to survive the experience and figure things out, Miriam must go to extremes to learn whether fate can be beaten or not. This won’t be everyone’s cup of tea—Wendig spins his story with Tarantino-esque multiplicity, and the book’s pyrotechnic profanity, bloody ultraviolence, and lack of romance are unlikely to appeal to fans of Laurell K. Hamilton or Patricia Briggs. But for those who like their noir with a twist of horror, this novel provides an engaging blend of occult surrealism, nihilism, and startling violence. Loved this book! I can't believe I waited so long. The first book in the Miriam Black series: “A sassy, hard-boiled thriller with a paranormal slant” (The Guardian) about a young woman who can see the darkest corners of the future. 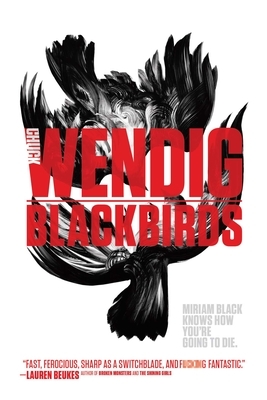 “Think Six Feet Under co-written by Stephen King and Chuck Palahniuk” (SFX), and you have Blackbirds: a visceral, exciting novel about life on the edge.